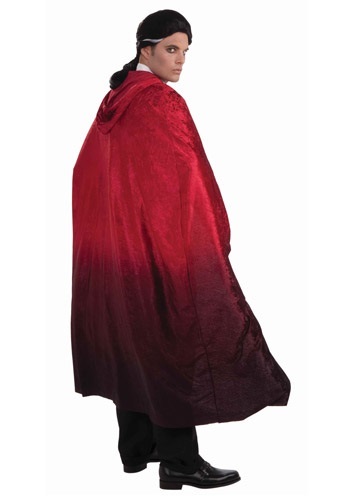 Be a mysterious nightmare this Halloween when you add this Red Faded Cape to your costume. Want to have a Gothic-themed guise this year, perhaps you'd like to be a blood thirsty vampire, or maybe the darkest incarnation of the devil is more along the line of what you're aiming for? Well, before you enter any party make sure you complete your demonic disguise with this haunting hooded cape. Enter the scene with your hood up. If you're lucky someone will ask who invited little red riding hood and then, dramatically, you can whip your hood back and unveil the horrifying costume you've prepared this year. Maybe your an evil zombified version of the classic Red Riding Hood or a terrifying witch. Either way, with this hooded and faded red cape added to any costume you decide on, a whole new level of sinister will be reached. Look and feel as villainous as Earth's greatest supernatural threats when this cape has your back this Halloween!